A reasonable argument can be made that some of the unrest in Ferguson, Cleveland, New York City, and Baltimore in response to the deaths of young black men at the hands of law enforcement, nurtured what CNN’s Van Jones dubbed “whitelash”: resentment among white Americans that fueled a false nefarious narrative that America must be reclaimed. The rise of Black Lives Matter as a social justice and political movement underscored the concerns among many in America that racial disparities remain ever present in society. Not only do these disparities persist but they are also being videoed and consumed by Americans daily. In fact, new research shows that race, rather than income or authoritarianism propelled Trump to victory last November. The “law and order” strategy embraced by candidate Trump, quite similar to Nixon’s southern strategy, is one of the themes Chris Hayes’ new book, A Colony in a Nation, tackles in its attempt to resolve questions of race, place, and justice. We live in a country of two regimes, according to Hayes: a nation whose laws reflect traditional, conservative values, and American exceptionalism; the other, a colony whose residents are routinely subjugated by laws that don’t reflect our collective national wisdom and aspirations, but are oppressive and demoralizing. In this dual America, our post racial Xanadu following President Obama’s victory never materialized. Meanwhile the soft bigotry of political and policy incrementalism that slowly and silently created the colony preserves the indignities that reinforce racial and class segregation. Hayes’ reflection on events of the past few years that brought race to forefront of our national dialogue is largely borne from his early life in the Bronx where traveling through New York City’s neighborhoods can seem like traveling to other lands or . . . more appropriately, back in time. Throughout the book, he ponders questions about our responsibility and accountability to one another in a civil society—considerations that white privilege and socioeconomic status (regardless of race) often thrust to recesses of our consciousness as we manage our own day to day grind. As long as order is maintained we feel compelled to push forward in the hope that whatever problems need to be addressed, someone else will solve them. This is not owed to complacency about the awesome responsibility citizenship demands of each of us, but rather a legacy of privilege that allows some of our peers to cast their eyes forward, just above the fray, mindful that the delicate equilibrium of our collective fate cold easily become undone. In a throwback to the 1990s, Hayes recalls New York’s squeegee men—the villains of Giuliani’s Gotham—when “seediness imposed a kind of mental tax on certain strata of the middle to upper classes, the mostly white city dwellers and commuters who found the ambient unruliness stressful.” The squeegee man became the catalyst (or scapegoat) for public policies targeting quality of life offenses meant to restore order. But the laws used to carry out these strategies shifted more of our society into the “colony,” and even more resources away from the most vulnerable. If the reader is unfamiliar with Hayes’ mention of James Baldwin’s A Report from Occupied Territory, bear in mind that it is not a perfunctory reference to reinforce civil rights-era romanticism. It is a historically important authentication of police engagement of Harlem residents in the mid 1960s. The scenes painted by Baldwin can stand for many parts of the country even today. 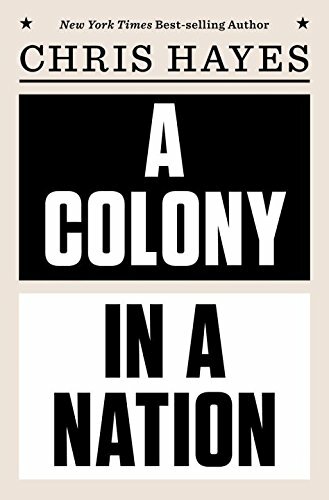 The nation/colony dichotomy is flexible when necessary since Harlem for example lost its stigma as a high crime, impoverished neighborhood now that gentrification is rewriting the narrative despite excluding the resilience of its historic Black population that remain loyal to the community. Meanwhile Donald Trump has taken a broad brush to inner cities (synonymous with African American populations in his mind) by labeling them as burdened with high crime and high unemployment without much use for the facts that prove otherwise. This nuance is important. For colonies within the nation to exist, the perception must endure. Legal, economic and educational barriers need to be fortified. Intended or not, Hayes’ implication is disconcerting: The colonies are necessary to strengthen the nation’s sense of purpose and identity.